[1:29] <thomas_sch> maybe this is a stupid question but from time to time programs die on me and the after image gets stuck on the framebuffer (afterimage as in framebuffer holds the last image and eats all keystrokes) but I can still ssh into the mashine any idea how I can reset the fb? [3:09] <Syliss> what about 3.4.4? [4:44] <squimmy> can anyone here tell me if zfs will work in rpi? [4:44] <squimmy> i'm figuring the lack of ram could be an issue? [4:59] <squimmy> are the 'other hurdles' things like poor arm support for BSD etc.? [5:08] <piney0> can anyone help me? I am trying to install RPi.GPIO 0.3.1a in python, and i'm getting an error about 'ZIP does not support timestamps before 1980' I have figured out that python thinks it's 1970, so the date and time are wrong in python. any ideas? [5:20] <squimmy> piney0: is the system datetime correct? [7:57] <exsodus> Any ideas how to fix? [9:34] <Gadgetoid> And suddenly a wild good morning appeared! [10:23] <booyaa> you have a good time? [10:23] <gordonDrogon> yea, really good, thanks. [10:24] <Gadgetoid> Nice setup gordonDrogon, all the Pi's! [10:25] <Gadgetoid> Is that what you've been working on? [10:27] <gordonDrogon> So hopefully in a few weeks. [10:27] <Gadgetoid> I might consider jumping through their hoops and ordering one! [10:27] <gordonDrogon> Gert is annoyed as if they were going to do it pre-made he's have used SMT LEDs as they're quite hard to solder by hand. [10:28] <booyaa> does a gertbord already come with board/circuit protection? [10:28] <gordonDrogon> What it has: A bit row of jumpers/pins to let you connect the 'raw' GPIO signals to a set if 74xxx bi-directional buffers. [10:28] <gordonDrogon> there is another jumper to let you set the direction of each buffer. [10:29] <gordonDrogon> so that's 12 buffered IO's. [10:29] <gordonDrogon> there are 3 buttons for input and 12 LEDs for output. [10:29] <gordonDrogon> some of the pins can be directly jumpered - e.g. the Pi's serial to the ATmega, or the Pi's SPI to the 2 on-board A/D & D/A chips. [10:30] <gordonDrogon> the motor driver and darlington drivers can be wire-jumpered. [10:30] <gordonDrogon> the ATmega can be jumpered to eithe the buffered IO, the motor or the darlington drivers. [10:30] <gordonDrogon> so it's a good general purpose IO type of biard. [10:31] <gordonDrogon> the ICs are cheap - the motor driver is the expensive bit apparently. [10:33] <gordonDrogon> I'm going to open up all the stuff on my blog site later today - although ultimately it might be hosted by Farnell. [10:33] <gordonDrogon> I need to check with Myra who's doing the manual first just to make sure everything is OK.
[10:38] <buZz> Gadgetoid: into the video driver? [10:38] <buZz> Gadgetoid: or just in an application? [10:38] <gordonDrogon> ebswift, rpi-update, or apt-get update? [10:39] <Gadgetoid> I have so many lego power functions motors just begging to be used like this! [10:41] <booyaa> is it easy to rig up mindstorm stuff with pis? [10:44] <booyaa> crikey it's bt powerwed (can you see how much i've researched this...)? [10:44] <gordonDrogon> I'm controlling a motor directly - and I think that might be the way to go for mindstorms, but I don't know how the NXT stuff really works. 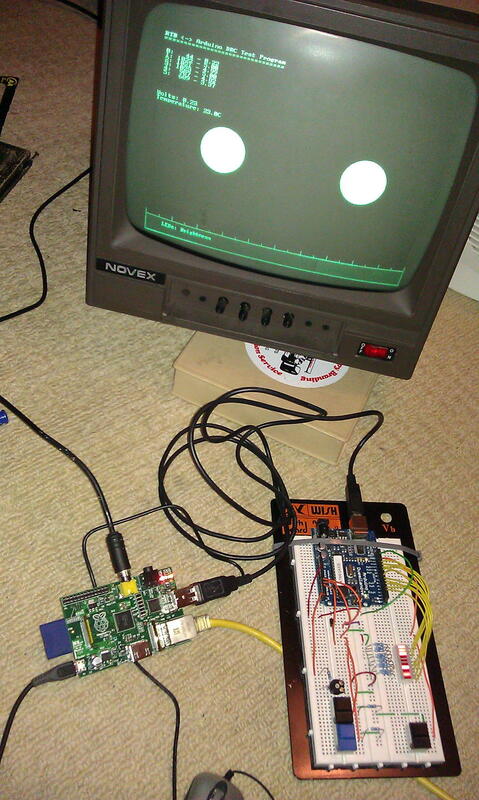 [10:45] <gordonDrogon> I was looking with a friend yesterday at sending IR signals from a Pi to the RXC 1 brick though. [10:46] <gordonDrogon> ebswift, well tha should work, but remember 'wheezy' is still a testing release of Debian, and not a sable version, so it might be prone to things like this, however I've had no issues with apt-get updat ; apt-get upgrade - so far! [10:47] <gordonDrogon> ebswift, it may just be the kernel & modules that got upset - I removed the package from wheezy that does that. [10:47] <gordonDrogon> Oh, it's frozen now? I wasn't expecting that. [10:47] <gordonDrogon> that is good news then. [10:47] <gordonDrogon> I might even be tempted to put it on my laptop, but it's still Lenny so I'll need to upgrade it to Squeeze first! [10:48] <gordonDrogon> Eben more or less said in Saturday that they were looking to make Raspbian the standard from what I remember. [10:49] <Gadgetoid> Isn't Raspbian basically Wheezy HF? [10:49] <buZz> you run linux from SD? [10:49] <buZz> doesnt it have a harddrive/SSD? [10:49] <reider59> Have you tried it with an external reader or is it the same? [10:49] <gordonDrogon> Sorry - SSD. Yes on the AAO. SD's on the Pi's. [10:49] <gordonDrogon> just getting confused here. [10:50] <gordonDrogon> actually the built-in SD reader on the AAO is faster than the internal SSD ..
[10:50] <gordonDrogon> ebswift, the ULNs are fine, but look at some of the H-Bridge drivers though - easier to do reversing. [10:51] <gordonDrogon> ebswift, ah, steppers - sure. [10:51] <reider59> For some reason I have to use SD Cards on my lappy in Win 7, they refuse to work on the main machine and internally connected USB reader, very occasionally I get one that works. [10:56] <buZz> you mean the version of windows is deciding what the drawing distance is? [10:56] <gordonDrogon> You can do all the microstepping in software - that's probably what the controller is on that card - probably an embeded PIC..
[10:57] <ebswift> so, let me get it right... if a stepper is, say, 48 steps per 360 degrees, you can microstep to more steps? [10:57] <gordonDrogon> although they're normally 180 stpes per revolution. [10:57] <buZz> is a lot of steps! [11:01] <reider59> not a game, it`s a simulator. One that many real world pilots prefer to there mega priced simulators they train on. [11:03] <reider59> I don`t play with space rockets, that doesn`t make them a game D`oh! [11:10] <Dyskette> I for one, do not love boardwalks. [11:10] <buZz> what are boardwalks? [11:15] <buZz> Habbie: did you see the alu raspi case? [11:15] <gordonDrogon> Gadgetoid, I may look at a nicer case for it - it's not actually that comfortable to wear. [11:15] <Habbie> buZz, not sure, url? [11:17] <gordonDrogon> magnus_, next, check /boot/cmdline.txt - that has the first rune in it to make the console work. [11:17] <Gadgetoid> megatog615: Why??? why is that? [11:18] <gordonDrogon> Eben had a bog of 200 Pi's on Saturday. [11:18] <magnus_> gordonDrogon, the first rune? [11:18] <Gadgetoid> gordonDrogon: 200 Pi's????.. dear god???. [11:18] <gordonDrogon> selling them for ?30 each. [11:19] <gordonDrogon> magnus_, yes, might have something like console=/dev/ttyAMA0 - make sure it says something like that. [11:19] <gordonDrogon> I bought a PiFace IO board too. [11:20] <gordonDrogon> magnus_, what does it say now? [11:20] <gordonDrogon> magnus_, unusual... I'll need to look it up as I removed it from mine - give me a moment. [11:22] <reider59> Gordon, I`m having a go at that fancy LCD Display where each character turns a different way, the video you saw. It states: display = Lcd('/dev/ttyUSB0') in the program, which is for the USB connection. Any idea what to put in for the parallel one we use? [11:23] <gordonDrogon> magnus_, but there should be other stuff in cmdline.txt - make sure you're looking at the right file! [11:24] <magnus_> which dist are you using for your rpi? [11:24] <gordonDrogon> I use Debian/Wheezy/Raspbian. [11:26] <magnus_> gordonDrogon, i noticed in your cmdline, console= is mentioned twice.. is that correct? [11:27] <gordonDrogon> magnus_, it's what was in the supplied one with debian. I removed it from my units as I used using the serial port as GPIO lines. [11:27] <gordonDrogon> what I think someone ought to do is replace the SD older with one of those posh push in push to pop-out ones. [11:33] <magnus_> oh. ok, so the arm core is not actally in charge of booting up the system? [11:33] <magnus_> what kind of core is the gpu? also arm? [11:41] <gordonDrogon> yea, I'm pretty new to actually releasing stuff under an open source license... I guess GPL is the most well-known, so gets used (and abused) a lot. [11:44] <gordonDrogon> and wiringPi is a library, so that's probably the way it ought to be. [12:17] <booyaa> anyone got a irssi auto join/nick identify script? [12:17] <Blazemore> Do you know how I can get system uptime in days in Python? Emulating uptime | cut -f 4 -d" "
[12:45] <izibi> is it possible to allocate less than 32mb to the gpu? [12:50] <buZz> the ABS injection molded ones? [12:59] <reider59> I have to say even if I have`nt got an immediate use for them I welcome any experiments with the Pi. Just like the LCD display fastened to a USB cord on a Cannon Camera. I may not use it but love to see the tricks people conjure up. [12:59] <buZz> ooo which meds? [13:02] <reider59> alsorts, but one is meant to kill severe pain signals to the brain (had a spine op and they killed my nerves). It does kill pain to some extent but my brain trips out for a few seconds or minutes and I only think I`ve done something. Hence gas gets left on, hot drinks go in the fridge, just have to double check everything a few times. Short term memory is shot to pieces too. [13:03] <reider59> Tramadol and Pregabalin cause me the most side effects. [13:10] <reider59> So instead of changing the program you just change the contents of the text file and almost instantly the result show on the LCD Module. [13:10] <buZz> did you ever play with LCDproc ? [13:14] <reider59> I want to learn Python and can do that and experience the soldering, fitting up, programming of the module. With LCDProc etc (all excellent programs) most of it is done in the background and I learn little from it. [13:21] <reider59> k a lot more may be possible from Python or wiringPi without being reliant on third party plugins. Something I want to tinker with even if we do have to reinvent the wheel at times. [13:24] <reider59> I know the codes for ever cell of every one of the 4x20 LCD so all that`s left is input to file, then send them to those codes. Line 1 = 128, Line 2 = 192, Line 3 = 148 and finally Line 4 = 212. not that difficult once you know the codes and how to put them in. [13:25] <gordonDrogon> Hm. just taken my old bigtrack to bits. [13:26] <gordonDrogon> with a view to putting a Pi inside it. [13:26] <gordonDrogon> ought to be possible. [13:28] <gordonDrogon> Hm. never heard of lcdproc until now. [13:28] <buZz> gordonDrogon: nothing connected to the bigtrack? [13:28] <buZz> why not do motorcontrol with the pi? [13:28] <reider59> The LCDproc domain names (lcdproc.net and lcdproc.com, lcdproc.org) were made possible by a generous donationin by CrystalFontz. yes they are in there. [13:28] <gordonDrogon> buZz, no lcdproc is not connected to bigtrak..
[13:29] <gordonDrogon> if I'd known about it I might have been tempted to work it into my LCD library, but hey ho. probably can't be bothered now. [13:29] <gordonDrogon> unless I have time. [13:29] <gordonDrogon> e.g. after making the BigTrak go..
[13:31] <reider59> Just enjoy what you do but remember we all have different needs, hence I agree with any experiment, not all do. If we were all the same in this world what a boring old place it would be. [13:43] <gordonDrogon> magnus_, have you tried using minicom to send stuff out the serial port to your remote device? [13:43] <gordonDrogon> izibi, why is the module compressed? [13:44] <gordonDrogon> magnus_, sure, but stick minicom on it - if that works then work on making the kernel work. [13:44] <buZz> izibi: which kernel are you running? [13:44] <l4mRh4X0r> magnus_: you may need to tell linux to. [13:44] <gordonDrogon> l4mRh4X0r, he has, but it looks like the serial connection migt not be working. [13:45] <gordonDrogon> screen isn't a serial termina. [13:46] <gordonDrogon> magnus_, can it? Hm. not in my day, but I've not used screen for about 20 years now. [13:46] <magnus_> you can go like "screen /dev/ttyUSB0 115200"
[13:47] <gordonDrogon> magnus_, more bloat to add to unix. [13:47] <gordonDrogon> magnus_, anyway - if you've tried that and its still not working, then look deeper. [13:48] <gordonDrogon> magnus_, the serial port does work - I've used it myself. [13:48] <gordonDrogon> magnus_, also check your /etc/inittab file - for a getty - in Debian it runs a getty by default and you can login on the serial port. [13:48] <gordonDrogon> so lots ought to be going out over it. [13:49] <booyaa> magnus_: how are you connecting to rpi's serial? [13:53] <hermanhermitage> is serial working at all? [13:53] <magnus_> hermanhermitage, for me? no in general? i hope so! [13:54] <magnus_> hermanhermitage, cool, like a baremetal program, or a linux program? [13:55] <magnus_> that'd be useful. i should just be able to put it in instead of my kernel.img, rigjht? [13:59] <magnus_> reading http://elinux.org/RPi_Low-level_peripherals it seems like GPIO 14 & 15 can be used by both UART 0 and UART 1. how does this work? [14:01] <magnus_> wrong how? RXD to RXD? [14:01] <hermanhermitage> yes not sure how i managed it! [14:02] <Jck_true> Anybody played with LIRCd on the RaspBMC package? [14:05] <gordonDrogon> magnus_, no - they are separate physical pins on the chip and the internal switches on the chip keep them separate. [14:06] <gordonDrogon> unless you enabled the aux. functions on those gpio pins to be serial, but even then, AIUI they are separate buffers in the chip, so shorting one wouldn't stop the other. [14:06] <acperkins> Does anyone know how to prevent the welcome file opening at boot in the RISC OS image? [14:10] <gordonDrogon> right. time to unpack my Pis from Saturday. [14:20] <mervaka> how was that thingy meetup in cam? [14:24] <gordonDrogon> it was pretty good - much shorter and a diferent format to what I was expecting, but good to hear the talks and Q&A sessions. [14:24] <gordonDrogon> I was able to show off my Lego fan connected to a Gertboard too! [14:26] <bionicRobot> where did you get the gertboard? [14:27] <mervaka> i need to get myself sorted with an ESC asap, my car project has stalled! [14:28] <mervaka> just noticed the unintentional pun there..
[14:30] <gordonDrogon> He asked the forum for help to get the ATmega going, and I replied and he sent me one. [14:32] <gordonDrogon> so that what I've been doing all the 3.3v ATmega stuff on. [14:36] <gordonDrogon> but various kernels and tweaks have had detrimental effects on them, but I've never had one fail to work on a laptop, etc. after a Pi. [14:37] <gordonDrogon> Gadget-Work, He made up 3 or 4 - Myra - the woman doing the manual, etc. has one and me that I know of. [14:37] <gordonDrogon> mcscruff, it's possible a type that the Pi won't recognise... what make, spec. etc. ? [14:38] <gordonDrogon> mcscruff, ah, ok. so it just "stopped".. ? [14:38] <gordonDrogon> I'd re-install all the /boot files and try again. [14:41] <stanley> What's your issue? [14:41] <stanley> It's getting really annoying. [14:41] <stanley> I thought it was the power since I don't have a real adapter in use (but I have one now). [14:41] <stanley> I might also have to return. [14:42] <stanley> It usually happens after some hours for me. [14:42] <stanley> I haven't tried with the proper adapter yet. [15:00] <magnus_> hm. so what is this ttyAMA0 really? my rpi seem to have two serial ports, tty1 and ttyAMA0? [15:03] <zeeZ> the things you can do with someone's IP! [15:04] <stanley> zeeZ: there's evil people. [15:04] <stanley> zeeZ: if the bot actually does anything important in terms of moderation, it's a problem. [15:04] <stanley> zeeZ: people DDoSing ops on IRC is not an unknown problem. [15:04] <stanley> (or unheard of). [15:04] <gordonDrogon> only if you think it can be hacked. [15:04] <stanley> No, it can't. [15:05] <stanley> How does (D)DoS have anything to do with hacking? [15:06] <stanley> yeah that's unlikely. [15:16] <gordonDrogon> I'm guessing a split is something that freenode does when one feeder server gets overloaded? [15:24] <gordonDrogon> spot of lunchtime now. [15:53] <tos9> Anyone happen to be awaare of any US vendors / coupons offering free shipping by any chance? [15:58] <IT_Sean> On the raspi? [16:02] <booyaa> how much is shipping? [16:06] <tos9> Anyways, no biggie, I'll order anyhow. Thanks. [16:12] <drazyl> order 200, then the shipping will be cheaper as a %ge! [16:13] <markllama> but you'll never get them so they'll never ship and you'll never be billed and that's even LESS! [16:13] <markllama> booyaa: worked for me. [16:15] <booyaa> does anyone have rpi running squeeze or wheezy? [16:15] <mm0zct> I know I'm being a bit of a lazy bum here but where should I be looking for info on reasing the Pi's cpu cycle counter? [16:15] <booyaa> can you do a sudo apt-cache dropbox plox? [16:15] <booyaa> cycle counter? that's not cpu speed is it? [16:21] <mm0zct> someone posted a logic analyser on here a week ago, which used the same principle, anyone remember who? [16:22] <IT_Sean> Firewire / cheap <-- pick one. [16:28] <booyaa> did ukscone do one as well? [16:52] <dirty_d> 4000 units/day now huh? [16:53] <gordonDrogon> pretty fantastic numbers though. [16:56] <lrvick> tough choice there. [16:57] <buZz> booyaa: they changed something in the matrix? [16:58] <buZz> better run! agents coming! [16:59] <dirty_d> lrvick, what is this cluster going to do? [17:01] <Hattara-pilvi> dirty_d: Are you using the NEWEST firmware the one from 2 days ago? [17:07] <gordonDrogon> firmware is a week or 2 old now. [17:35] <M0RBD> Blazemore: why it was his choice. [17:35] <M0RBD> to buy it. [17:42] <reider59> I had to solder my LCD Module, was dreading it. Thankfully it works and has opened up an whole Vista of stuff to get into inc learning Python. [17:46] <gordonDrogon> reider59, it's working now? [17:48] <reider59> Yes, I had to give up on the first approach and go the same rote as Texy with his Python setup. I just don`t understand C so I didn`t want to keep mithering you. I`ll try again when I next wipe the SD Card. [17:49] <mervaka> reider59: C is worth learning. [17:49] <mervaka> it's like, the latin of programming languages. [17:50] <markllama> complete with whacky math. [17:52] <reider59> ll on any line now. Had I not known about the split between 1/3 and 2/4 it would have made less sense. [17:55] <reider59> It`s worth learning but fist off I wished to start with Python, then later go to C. At the moment I take meds which shall we say makes a lot of stuff not add up, brain goes out of tack at times and just makes it harder work. so I`ll start with the Python then do C later. I tried C the other night and had my first headache in years. [17:55] <Gadgetoid> Jeff's Totally Awesome Guitar!? [17:56] <Gadgetoid> reider59: Generally there's something wrong with you if C *doesn't* give you a headache! [17:58] <mm0zct> is there a way to prototype with high speed signals that works better than breadboard? [17:58] <reider59> adjusting the program yourself, just make the changes in a text file. [18:01] <reider59> My power fly leads I made up myself because I didn`t have enough male/female jumper leads. I got an old puter case and cut out a few of the press on power cables to the motherboard. Some were dual and trebl connectors so I snipped off the rest and made them single after pulling the spare wires out. Been working perfectly as POS and NEG power leads. [18:02] <gordonDrogon> Gadgetoid, yea, maybe! [18:08] <mm0zct> define "low freq"? [18:09] <reider59> Is a text file still a text file in Linux or does it use some other format that can be read as a textfile? [18:23] <Chetic> how can I remotely with ssh start just X and then start programs in that X session? [18:25] <drazyl> start X on the local display or run an X program remotely? [18:26] <reider59> I use Xming in Windows, start the Pi, SSH in but have it set up to log into Xming which automatically creates a VNC client on the Pi. [18:31] <gordonDrogon> the motors work which is important. [18:31] <gordonDrogon> and it has the encoder diode. [18:31] <gordonDrogon> on one motor only. [18:33] <gordonDrogon> my plan was to refurbish this one, but it needs work on the mechanicals... so I may use it as a test-bed then buy a new one and strip the controller and put the Pi in it. [18:33] <gordonDrogon> biggest issue is power (as usual). 4 D cells is only 6V - marginal to power the Pi from. [18:34] <dirty_d> cant install it on a gpt disk partitioned first with linux? [18:38] <gordonDrogon> wonder how to get a 12V battery inside the battery compartment. [18:38] <przemo_rex> hi. I'm trying to compile kernel to enable raid support but without luck. has anybody managed to enable mdadm raid on raspbarry? [18:39] <reider59> You may be able to extend the compartment, a lot of these things use more space than they need for the electrics just because the whole vehicle is big. [18:41] <gordonDrogon> I've taken it to bits - completely. [18:41] <gordonDrogon> it's a little bigger than 4 D cells, but not much. [18:41] <ReggieUK> make some panniers? [18:42] <reider59> can you fit 2 cells of those together? [18:42] <ReggieUK> what kind of unused space is there inside the bigtrak? [18:44] <Stoob> but may be small enough? [18:45] <Gadget-Mac> How about a 6V SLA rather than 12V ? [18:47] <Gadget-Mac> Why 12V ? [18:47] <gordonDrogon> Looking at SLAs. [18:47] <gordonDrogon> 12V as 6V is not high enough to run a 5V regulator off reliably. [18:47] <Stoob> why not 9? [18:47] <ReggieUK> why not 7.4? [18:48] <gordonDrogon> can't get 9V sealed lead avids. [18:48] <Stoob> why not 9.6? [18:49] <gordonDrogon> well, it was the lithium battery that caught fire - under water. [18:49] <IT_Sean> Some tool was stupid enough to wear one of those jackets into the water!? [18:50] <gordonDrogon> IT_Sean, yes - in a dry suit - the dry suit leaked and salt water got to the battery. [18:50] <gordonDrogon> well - they're commonly used. [18:50] <mm0zct> diver or sailing/windsurfing? [18:51] <IT_Sean> gordonDrogon: commercial divers typically use a surface fed hot water hose to do that. Not a battery powered heater under the drysuit. That's just asking for trouble. [18:53] <gordonDrogon> mm0zct, sure it wasn't the housing that blew? [18:54] <IT_Sean> T'was a seal. [18:54] <gordonDrogon> it's a daft sport. I've jumped in with the best part of 10K's worth of kit strapped to me one way or another. Most of it electrinically controlled! [18:55] <gordonDrogon> cameras, strobes - stupidly expensive. torches. Who on earth other than a diver would pay ?400 for a torch! [18:55] <gordonDrogon> dive computers - ?1000's ..
[18:55] <gordonDrogon> I wrote a program to generate tables, laminated them and just carried a D timer. [18:55] <gordonDrogon> The mini Q40's are great. [18:55] <IT_Sean> GordonDrogon, i had a backup in the form of a secondary depth gauge. But, no air gauge. I ended up aborting the dive. [18:56] <gordonDrogon> IT_Sean, ah, one of those integrated units. [18:56] <IT_Sean> If i'd had a backup depth and air gauge, i'd have continued. [18:56] <gordonDrogon> it that had been me..
[18:56] <IT_Sean> But, without a gas readout, i felt it was best to end it. [18:57] <IT_Sean> The primary perimeter seal on it blew at about 100 ft, ona 120ft dive. [18:57] <IT_Sean> and salt water does not mix well with electronical bits. [18:58] <gordonDrogon> I dive an Inspiration. Done some silly deep stuff. All good fun. [18:58] <IT_Sean> 120ft is the deepest i have done. [18:58] <gordonDrogon> not always good fun, but mostly. [18:58] <gordonDrogon> that's deep enough. [18:59] <gordonDrogon> deco just gets stilly then. [19:00] <gordonDrogon> no - I think anyone who can dive is cool in my books - warm water or deep cold. it's all good. [19:00] <gordonDrogon> I've done both. BASC AD, PADI DM. [19:01] <gordonDrogon> Pay and Dive Immediatly. [19:01] <gordonDrogon> I got fed-up badge collecting and just went diving. Lost track in the end. Did at least 1500 hours on my rebreather and possibly the same before that on open circuit. [19:04] <gordonDrogon> stupidly expensive "sport". I even owned 2 boats at one point (not at the same time). [19:04] <gordonDrogon> exo, yes. 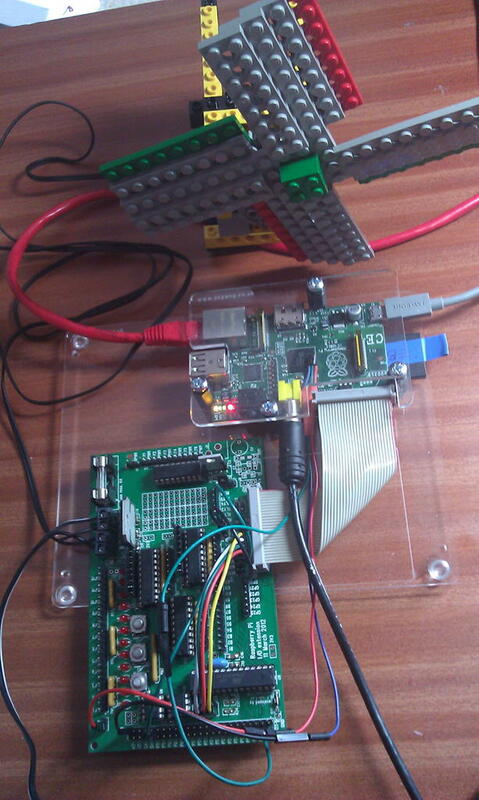 you can run at least 2 Arduinos off the Pi's USB. 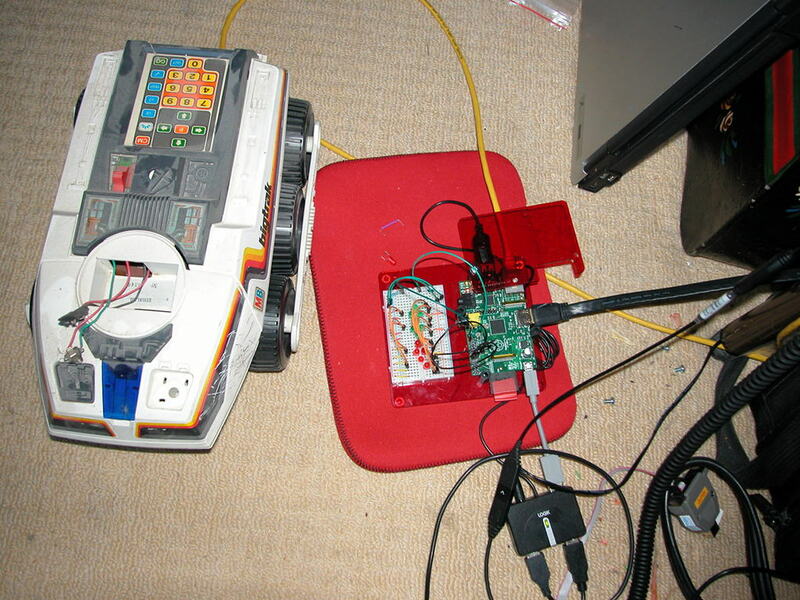 [19:05] <gordonDrogon> exo, http://unicorn.drogon.net/piduino.jpg just one arduino there though. [19:05] <gordonDrogon> boats are even more of a hold in the sea to throw mony at. [19:05] <IT_Sean> I had a boat once. Sold it before college. [19:05] <IT_Sean> Little 18ft runabout. [19:06] <IT_Sean> Fun thing. But way too expensive to maintain. [19:07] <gordonDrogon> I had a 15' Zodiac with a 40hp engine on the back... silly little boat, way over powered, but fun... We'd squeeze 4 divers into it!!! [19:07] <exo> gordonDrogon: is that your setup? [19:07] <exo> gordonDrogon: what pwr supply are you using? regular cell phone charger? [19:08] <gordonDrogon> IT_Sean, yea, never that cold in england. [19:08] <gordonDrogon> exo, 700mA minimum. [19:08] <IT_Sean> I miss my little boat sometimes. I do not miss the expenses, though. [19:09] <gordonDrogon> Heh.. I searched for 2V batteries - and it's given me 3000VA ones - good for welding then. [19:09] <gordonDrogon> Doh. AH, not VA.
[19:10] <gordonDrogon> nid0, Heh.. Yea we have an inflatable canoe - it's good fun! [19:11] <przemo_rex> hi. I'm trying to compile kernel to enable raid support but without luck. has anybody managed to enable mdadm raid on raspbarry? [19:11] <nid0> "without luck" how? [19:14] <gordonDrogon> There is no reason Linux MD shouldn't work on a Pi, so make sure you get a basic kernel compiled first. [19:25] <TimRiker> running squeeze... what audio device should be usable? alsa? oss? something else? [19:31] <TimRiker> what linux releases, if any, include floating point, audio over hdmi and opengles support? [19:36] <gordonDrogon> TimRiker, Debian give that, but Raspbian which is a version of Debian Wheezy will do the hardware fp by default. [20:42] <krnlpanic> I give up.. :/ Arch Linux-arm: ldconfig: /usr/lib/ not a symbolic link when installing anything with pacman... I've been up and down on google but can't find what's causing it... I read somwhere that it had something to do with libspotify.so but pacman -R libspotify(.so) results in package not found.. anyone have this happen before? [20:43] <krnlpanic> I must have something wrong somewhere because now I cant exec mocp... (segment fault)..
[20:44] <rabbidrabbit> I don't know about arch linux arm, but arch recently had an update the move /lib to /usr/lib and made /lib a symlink. Did you have an update that failed. [20:45] <krnlpanic> rabbidrabbit: Quite possibly... lemme look into that. Thank you! [20:46] <Hattara-pilvi> Is old analog tv style moving corryption and general hang marks of a bad powersupply? [20:47] <rabbidrabbit> booyaa: It's only terminal if you force the install. [20:49] <TimRiker> rpi_pisces_r3.img does not boot up all the way to a console for me. [20:50] <rabbidrabbit> Hattara-pilvi: oh, ok. Though I think kmod now looks in /usr/lib. [20:55] <krnlpanic> Hattara-pilvi: I understand that... "I read somwhere that it had something to do with libspotify.so but pacman -R libspotify(.so) results in package not found.."
[20:57] <nickds> I was wondering if I could have some assistance with omxplayer ? [20:59] <nickds> Ok, well everytime I try to load omxplayer, be it from bash, or within lxde/mate using terminal, it bombs me out with the message "have a nice day". [20:59] <Hattara-pilvi> nickds: Did you give it a media file as parameter? [21:00] <mpthompson> nickds, what memory split with the GPU are you using? [21:08] <nickds> it was the 128 file I was meant to copy wasnt it to get the split ? [21:11] <izibi> is it possible to power the rpi using the header pins instead of microusb? so are these just connected or is there any fancy stuff in between? [21:13] <Hattara-pilvi> nickds: What is your distro? [21:14] <nickds> which one are you using ? [21:17] <gordonDrogon> why the anti-debian bias? [21:18] <gordonDrogon> izibi, it is possible to power the Pi via the 5V line on the GPIO connector, but it's not recommended as there is no polyfuse protection. [21:21] <rabbidrabbit> I agree with Hattara-pilvi. After moving from debian to arch I haven't looked back. I love arch. [21:25] <IT_Sean> do you NEED "uptime protection" on your raspi, or is it just for epeen? [21:30] <gordonDrogon> more by the accident of not being here to use it and reboot it! [21:32] <Hattara-pilvi> gordonDrogon: O_o what? [21:35] <rabbidrabbit> gordonDrogon: Do you ever update the kernel? Don't you need to reboot after updating the kernel? [21:35] <gordonDrogon> rabbidrabbit, not on that machine, no. it's relatively safe. [21:36] <gordonDrogon> it's one of a pair and it's counterpart does get updated and tested from time to time. [21:36] <gordonDrogon> it's uptime is only 377 days. [21:37] <gordonDrogon> I had a Dell that just stopped one day - 4 years and about a week of constant uptime. [21:37] <gordonDrogon> not bad for a desktop. [21:38] <gordonDrogon> I'm going to need to reboot it at some point though - when I built it, I foolishly didn't include IPv6 in the kernel. [21:42] <gordonDrogon> I then get frightened to power cycle stuff that's been up a long time - things like the bios batterys fail..
[21:44] <gordonDrogon> Old PC, but obviously one that was well built. [21:44] <gordonDrogon> My long-uptime PC here is running 100% from RAM - it boots of a flash IDE drive. [21:46] <gordonDrogon> you got a goodun! [22:05] <magnus_> t the full bootup sequence on the serial port, even beyond the handover? [22:07] <magnus_> grzywacz, i'm guessing getty app reads this /etc/inittab? [22:11] <booyaa> magnus_: still having probs with serial? [22:13] <booyaa> magnus_: just out of interest which distro are you using again? [22:45] <gordonDrogon> Gadgetoid, it won't compile. [22:54] <gordonDrogon> I presume that's the error you're seeing? [23:00] <Gadgetoid> gordonDrogon: Yup, that's the one! [23:01] <Gadgetoid> You have to patch AVRDude for it to work, eee! [23:14] <gordonDrogon> can't you just put in some dummy data before it, so it's not at the start of a page? [23:15] <gordonDrogon> I didn't understand the 'atest' either. [23:15] <gordonDrogon> to make it compile without warnings. [23:23] <peol> Does anyone know where (which repository) I should watch for the development of ALSA for the rpi? [23:33] <Gadgetoid> Good night all! [23:42] <exo> anyone here with a rPI and an arduino? [23:44] <exo> have you guys tried using inotool with the rPI? [23:46] <gordonDrogon> and use vi (or vim) as the editor. [23:46] <gordonDrogon> and I don't need python for my stuff either. [23:47] <exo> came across that. maybe there is an easier way? [23:48] <gordonDrogon> you just need to know how to compile, link and use avrdude. [23:48] <exo> can you point me in the right direction ? [23:48] <gordonDrogon> avrdude is the program that uploads a .hex file to the atmega. [23:48] <gordonDrogon> what arduino do you have? [23:49] <gordonDrogon> ok. hang on moment or 2. [23:49] <exo> have you guys used alliedelectronics to purchase the pi? [23:51] <gordonDrogon> the biggest issue is going to work out how to link in the wiring stuff. [23:51] <gordonDrogon> I used RS and Farnell in the UK. [23:54] <gordonDrogon> exo, ok - so it's tricky using the standard arduino installs - mostly because you'll need to compile & link in with the arduino libraries - wiring.h, serial, and so on. [23:55] <gordonDrogon> so maybe starting with that inotool might be a good idea. [23:57] <gordonDrogon> that's a makefile from one of my projects. [23:58] <gordonDrogon> so if you look at the 'uno' section, it has the avrdude command in it to send the .hex file to the Arduino via USB. [23:59] <gordonDrogon> the @ just tells make to not echo the command.